The Danish Cancer Society (Kræftens Bekæmpelse) has awarded our group two postdoctoral fellowships: one to Edward Horton and one to Raphael Reuten. Both fellowships are due to start in spring 2019 and will last for 3 years. Edward’s project aims to analyse interactions between cancer cells and their microenvironment to determine how metastatic cancer cells grow in some organs but not others. Raphael’s project aims to determine the role of laminin heterotrimers during tumor progression. On Monday 6 November 2017, Professor Janine Erler received the Lundbeck Foundation’s Research Prize for Young Scientists, which is a personal, honorary award of DKK 300,000, given to a young scientist under the age of 40. The prize is awarded once a year to acknowledge a particularly promising scientist who has produced outstanding research in the field of biomedical science. “Janine Erler is a researcher who can take on almost anything. She is a great talent, a skilled researcher, a popular lecturer, a much-used assessor for journals and foundations, a talented research leader and an expert communicator, who can see the commercial potential of her own research. With the 2017 Research Prize for Young Scientists we wish to recognise Janine’s vital scientific contributions and dedication to using her research to create value for society,” says Anne-Marie Engel, Director of Research at the Lundbeck Foundation. Read more at Lundbeck or BRIC websites. We are happy to announce the addition of a new postdoc to our group. Please welcome Dr. Pier Giorgio Amendola. Pier is an Italian postdoctoral scientist with a solid background in molecular and cellular biology. Pier earned his Msc in Molecular Biology at the Weizmann Institute of Science in Israel, studying the role of the tumor suppressor p53 in cellular differentiation and cancer. During his PhD at BRIC, University of Copenhagen, Pier discovered a novel function for a histone modifier in DNA Damage Response, a pathway which is frequently compromised in several tumors. In the Erler lab, Pier is focusing his efforts on the development of new effective anti-metastatic therapies with the aim of improving current treatments, including the survival and well-being of human patients. We are very excited to have Pier in the lab and we look forward to follow the project progress. We are happy to announce the addition of a new postdoctoral scientist to our group. Please welcome Dr. Tine Thurison Røndbjerg. 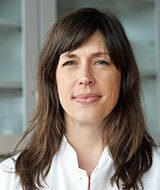 Tine is bringing in extensive expertise in translational cancer research, animal models and biomarker research. Tine completed her PhD at the Finsen Laboratory, University of Copenhagen in 2014, where after she moved to the US and continued her research in the lab of Dr. Charles Craik at University of California San Francisco. In the Erler lab, Tine is focusing her efforts on a collaborative clinical project, aiming at offering personalized treatment to metastatic cancer patients in Denmark. We are very exited to have her in the lab and we look forward to follow the project progress.